tl;dr: Confidence and programming ability are not correlated. If your job post requires a developer to evaluate their own skill, you're doing it wrong. Their breadth of development knowledge exposes them to topics they realize they could know more about. And their depth of knowledge in a specific area helps them understand how deep expertise can go in areas they don't understand as well. These types of people gererally apply a healthy dose of self-questioning when they see a job post. Don't make them feel like they're wasting time talking to you if they don't think of themselves as stellar developers. Job titles do matter. However inadequate, they're essential in the UI of most job platforms. There's a good chance the title will be the only thing a job seeker reads. Try to convey only what you're looking for and avoid synonyms for "good". When you're thinking of the title, picture an employee saying it to someone else. Hearing someone say, "I'm a stellar developer," or "I work as an ace developer," is ridiculous. 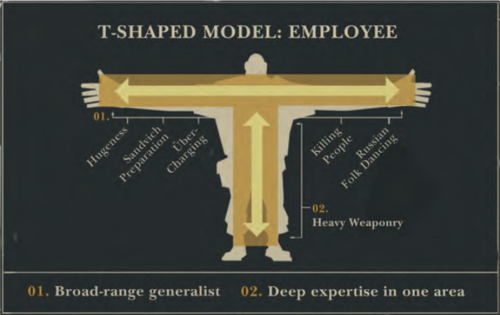 Do you need a specialist or a generalist? What specific areas do you need an expert in? Can you afford a specialist? Do you want a technical person who cares more about the business/market challenges you face or do you want someone who cares more about the technical challenges? 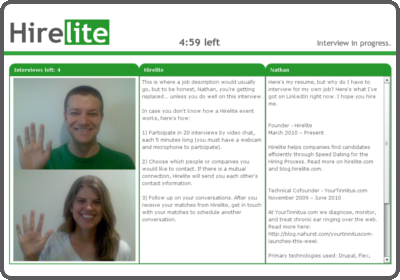 Hirelite runs "speed interviewing" events over video chat to connect software engineers and companies hiring. If you're looking to evaluate the software job market or looking to hire, check out Hirelite.com. We have upcoming events focused on NYC, SF, and purely remote positions. As a software engineer, if you've been to a tech event, you've probably been asked to cofound a company with a non-technical founder. We've collected a number of warning signs that come up in these types of conversations here. We've included 11 notable signs in this video. Can you spot them? Anything we didn't include? "I'm in the process of launching a couple of startups"
Many first-time entrepreneurs ping-pong between startup ideas without market-based justification until they burn themselves, their money, their cofounders, or all three out. Be extremely careful about getting involved with someone like this. Make sure that the non-technical cofounder is serious and committed enough to a concept that they're willing to test it in the market. Writing a bunch of code and finding out your cofounder doesn't care about the concept anymore is not fun. "leave my finance job to build a social networking site that will revolutionize the marketing space"
Ideally, the non-technical cofounder's skills will complement your own. Someone on your team needs to have experience or reliable contacts in your target market, and if that's not you, it needs to be them. On a more time-sensitive note: technical people are in huge demand right now! If you're very interested in a certain space, why not partner up with someone who does have experience in that area? Right now you're the tougher person to find, and whoever you approach will probably be thrilled that a technical person wants to start a company with them. "need someone to buy the domain"
A non-technical founder who registers a domain and has a basic web presence communicates, "I'm willing to do things outside of my comfort range for my company". Buying a domain and putting a simple page there requires commitment to an idea and some technical persistence (especially if they choose GoDaddy). It's well within their capabilities to have a basic web presence for their web startup. If they don't, it often translates into a lack of respect for technology and a lack of willingness to understand how things get built or work. "... and build it for me now"
A non-technical founder needs to know that websites don't "just get built". They get crafted. They get tested. They get maintained. A technical cofounder is not a code monkey. You are a cofounder, and you're taking an idea and making it viable by building something. You understand how the business works just as well as the non-technical founder; however, you have chosen to focus on the technical implementation of your product instead of business development and fundraising, for example. "Actually, it's the third one that has bailed. They've all been idiots." Sometimes things don't end up working out between cofounders. Nothing to see there. The technical cofounder could have been completely wrong for the project, could have lacked technical skills, or could have embezzled money from the company. At some point though, it's more likely the non-technical founders' fault. That point is probably somewhere between two and three cofounders who have bailed. If there's any way you can get in touch with the previous technical cofounders to get their perspective, do that. Hint: the commit logs usually have their email address. "This time, I'm really looking for a rockstar though. A real ninja guru." "Rock star" may have communicated a trendy vibe at one point, but those times have passed. Now it communicates a desperate attempt to seem cooler than they really are, a sign that they're too full of themselves, that they're a slave driver, or that they're just naive. For more detail, see What developers think when you say "Rock Star". "They're going to come flocking to us." Your non-technical founder should express a strong desire to get market validation of their concept. If you're making medicine, you can build it and they will come. The need is so undeniably visible. Websites are different. If your non-technical cofounder can't see any possible way that their concept might not catch on, they are dillusional or naive. They'll probably compromise your ability to ship without things being perfect, further delaying your ability to test your product's viability. "we'll just buy a bunch of followers on twitter"
It's unlikely the non-technical founder will suggest something outlandishly unethical (like "let's use our users' credit cards to make company purchases"). But at some point, they may suggest something that doesn't quite click with your ethics (like "we can trick the user in to signing up by suggesting the product is free but after they try it out, they actually have to pay for most things!"). Pay attention to these feelings you have. You need to be able to trust your cofounder, and these types of ethical issues tend to get magnified in times of trouble (which most startups run in to frequently). This is typically a later stage conversation, but when it comes up, they should be willing to tell you how much of the company you're getting. For more on this topic, see these posts from Chris Dixon and Venture Hacks. How much should you expect? It's a function of how much risk they've eliminated from the business (having just wireframes eliminates ~0 risk). Think of it from this perspective: Is it worth giving up [100 - (your equity share)]% of a company to have them join you? "This idea is so good though, I'd really appreciate it if you'd sign this non-disclosure agreement." In the early stages of a company, non-technical founders need to validate their concept. If they're not telling everyone they talk to about the idea, they're probably not getting enough feedback. Asking you to sign an NDA very early in your conversations indicates a naivety about startups, recruiting, and development. At some point you may need to sign one, but it will be well after you know what the company's product does and how the business model works. If the non-technical founder doesn't ask you anything about yourself, your interests, your tech skills, etc, they're probably either desperate or lack empathy. Both are problems. Desperation can lead the non-technical founder to hire people who aren't a good fit for the team. A lack of empathy can make it hard for the non-technical founder to understand future users, clients, partners, and employees. Hirelite is on a mission to put headhunters out of business. We host speed interviewing events using video chat where 20 job seekers talk to 20 companies for 5 minutes each. If you're looking to evaluate the software job market or looking to hire, check out our upcoming events focused on San Francisco/Silicon Valley and New York City. T: Hi, I'm a software engineer at Initech. What do you do? N: I'm an investment banker, but I'm in the process of launching a couple of startups! T: Interesting. Tell me about them. N: I am going to leave my finance job to build a social networking site that will revolutionize the marketing space. I've got all the wireframes and planning done, and just need someone to buy the domain and build it for me now. I'm actually looking for a technical cofounder now because mine just left. T: I'm sorry to hear that. How did that happen? N: Actually, it's the third one that has bailed. They've all been idiots. This time, I'm really looking for a rockstar though. A real ninja guru. T: How are you going to get people to use your service? N: We have all the features. Every single feature our users want, we have. They're going to come flocking to us. If that doesn't work, we'll just buy a bunch of followers on twitter! T: You have every feature? How far along are you? N: 90 percent of the site is built. It's been TONS of work, but we've got to make sure it's absolutely perfect before we release it. T: Hmmm. Tell me again... what does your site do? N: I'd love to tell you! This idea is so good though, I'd really appreciate it if you'd sign this non-disclosure agreement. Then I'd love to dive in deeper. This is such a great idea, we know someone will copy it the instant they hear it. T: Just curious. How much are you going to pay your technical cofounder? N: I'm offering 100,000 shares of a company that is going to be huge. T: How much of the company is that? T: But how much of the company with the technical cofounder own? N: Listen, this thing is going to be huge. And we're offering so many shares! Come on. Sign this non-disclosure agreement. I'd love to tell you more! Note: These conversations are typically spread over weeks or months, so you will have to watch more closely on your own. We're thrilled to announce that Hirelite has acquired Ohours to foster face-to-face relationships both in person and by video chat. Along with the acquisition, we've released an enhanced user interface on Ohours and will release more exciting improvements soon. Our vision at Hirelite has always been to connect people for one-on-one, face-to-face conversations - no middlemen required. Until now, Hirelite has helped companies and software engineers connect directly for interviews via speed interviewing events, primarily over video chat (often facilitating hundreds of interviews per event). Ohours gives us the chance to push beyond hiring and create a broader community of people connecting directly. We'll help people share their expertise and interests without the awkwardness of wandering around "networking" events. What's happening to the Hirelite and Ohours services? You will be able to use both Hirelite and Ohours as you have in the past. Over time, you'll see some of Hirelite's screening and hiring related features in Ohours, and some of Ohours's flexible, less event-focused features in Hirelite. Inspired by a previous post on the locations of the July "Who is hiring" thread on Hacker News, I wrote a script to pull down all the who's hiring threads and display trends of requested languages, frameworks, data management, and mobile operations [1,2,3]. Let me know if you see any languages, frameworks, data, etc missing, and I'll try to post an update soon. If you’re thinking about switching jobs, but don’t want to do a time consuming job search, you can interview 20 companies for 5 minutes each over video chat on Tuesday and Wednesday through Hirelite.com (many of the companies are mentioned in the Who's Hiring thread). You can find the code used to download and parse the data on GitHub (the raw data is also here too). To embed the graphs I'm using Google Fusion Tables. Please let me know if you see any I missed. You're a developer, and you've just been pitched a startup idea by a non-technical founder wanting you to join them in building a company. It's the 10th time this month this has happened, and you're getting more and more skeptical. "Why shouldn't I just start something on my own? After I have a basic product, I can bring a non-technical partner on." If you're joining someone else's company, the team has to be good enough for you to give up [100 - (your equity share)]% of the company. Let's consider the situation where there is a sole non-technical founder approaching you to be the other member of the founding team. How should you evaluate that person/startup? First: As a developer you are worth a lot intrinsically and due to market forces: You're going to make the thing that your company is selling. Aside from that, there are relatively few of you. Do not sell yourself short. As a developer myself, I'm always concerned that there are much better developers than me and that there's so much I don't know. You've found the right non-technical co-founder if you feel like a bit of a sham for not being good enough to work with them. This is not just speculation: from our position (Hirelite connects developers with companies looking to hire them via speed interviewing over video chat), startups value a developer about 50% more than a non-technical person with a similar level of experience/skill/etc . With this much value, what qualities should you be looking for in a non-techincal co-founder to make sure you're getting your time and effort's worth? Few have all of these qualities, but your non-technical founder should have at least a few of these. Start off by requiring at least two of the qualities below, and for every two years of experience you have, add one more of these requirements. Traction refers to the key metrics for a startup both in absolute size and growth rate (metrics around the number of users, user engagement, user acquisition, etc). It's kind of a fuzzy concept, but a startup with "traction" has limited the risk of a significant part of the business, specifically the will-anybody-care-about-what-we're-doing part. B2C startup where user growth is a key metric: 200 people who have given the startup an email address in a month or 50 people who have given them an email address and (on average) recruited one friend to give an email address too. You want to establish that the concept has legs of its own and not just the non-technical person getting their immediate friends and family to use the service. Traction is the great equalizer. If the non-technical person has no other qualities in this list, but the startup has traction, just make sure you work well together (the subject of another post), and you're all set. Warning sign: The non-technical founder tells you they need you to build something before they get any kind of adoption. A non-technical founder has domain experience if they've worked in the industry where the startup is addressing a problem. Three years of experience in that industry is good rule of thumb. Warning sign: As someone with little market experience, you instantly see holes in the business model that the non-technical founder has not already thought about. "We're going to go viral." Why is the product fundamentally viral in nature? Why is the product more valuable to users who get their friends to join? "We're going to get blogs to cover us." Which blogs? Do you have a relationship with them? Have you ever been written about on a blog before? "We're going to SEO the hell out of it." Why can't other companies do this? How reliant will the startup be on content? Who will write it? Why can't other companies beat us at this? "We're going to A/B test until we find a message that resonates." Do you see A/B testing as a mechanism for finding the vision of the company? This post on Startup Marketing Ideas will make you impervious to the most suspicious startup marketing claims. The best way to evaluate someone's marketing ability though is to have done it on a small scale yourself. Try to get people you don't know using at a site you've built. It's tough work, but you'll learn a lot about what it takes to market something and you won't be fooled as easily by people who don't know what they're talking about. Has the person raised a non-friends-and-family round before? Have they ever worked in venture capital? Do they have anyone committed to funding this company? If the answer to all these questions is no, the non-technical founder's ability raise capital is speculative. Warning sign: The non-technical founder answers no to those questions, but thinks it will be easy to raise capital. Is relentlessly focused on making sure you're making the right product for the right market. Has a clear vision of what success for your product looks like and is probably addicted to metrics. Knows when to cut features and can prevent you from wasting time on developing irrelevant features early on. You can point to any piece of a product and ask "Why?" and they have an answer. Warning sign: None. Everyone can make decent wire-frames. Be careful, and consider having a product person you respect help you evaluate the non-technical person. For any site with a strong software component, the non-technical founder needs to have a respect for software development. They need to understand that as the technical co-founder, you're going to be a key collaborator in the business not a code monkey. They get extra points if they've coded in the past or are eager to learn the basics from you. Warning sign: The non-technical founder says at any point, "Now I just need someone to build it for me." There not much that can replace having worked at a startup before: the constant ups and downs, the constraints of limited resources, the agility, the constant struggle to keep the business alive. Any role counts: sales, business development, marketing, product, software engineering, community management, customer service. Extra points for being on the founding team. Warning sign: The non-technical founder tries to get you to sign an NDA before telling you about the startup or gives you the feeling that they don't know much about startups at all. Everyone has connections; make sure the non-technical founder's connections are relevant. The connections should contribute to market intelligence, fundraising, and user growth. Ideally, the person has some kind of blog or social media following in the market the startup targets. Warning sign: Following 2,893. Followed by: 35. An MBA: they don't hurt, but don't favor them over anyone else because of it for startups. A career in finance or management consulting: unless your startup is in those industries, their big company tendencies could clash with a startup environment. They might not; just use your own judgement. Someone who calls themselves a serial entrepreneur. People throw this term around only slightly less than "pivot". Look at their track record for successful exits or otherwise successful companies if they call themselves this; otherwise, disregard it. We're not trying to trash non-technical people here. This is largely based on market demand for developers and our experience seeing early stage startups (bootstrapped and funded up to Series B) and developers interact. We often see developers able to partner with non-technical co-founders who are far more experienced. Additionally, you can see this trend at later stage companies. Example: a developer with 3 years of experience in NYC can make $110k at a big company while a business analyst with 3 years of experience could make somewhere around $80k. Comments on Hacker News too. Recruiter: We have a few preliminary questions we always ask to determine if a candidate will proceed. Recruiter: Do you have J2SE? Recruiter: Yes, yes, but do you have J2SE? Me: (realizing we were playing poor-grammar-buzzword-bingo) Yes. Recruiter: We're looking for real rock stars here. How good are you at programming on a scale from 1 to 10? Just give me a number. Recruiter: Well, we were really only looking for only 9's and 10's. Recruiter: Do you have any friends that are 10's that I could reach out to? Me: You're asking me if I have friends who would rate themselves a 10 as a developer? Me: I wouldn't be comfortable doing that. Sorry. Good bye. Needless to say, I was not asked back for an in-person interview. This is pretty much as classic as the Dunning Kruger effect gets in an interview. Both experiened hiring managers and experienced job seekers have worked with people who think they are much better than they are. Effective hiring managers don't expect candidates to evaluate their own skills on an arbitrary scale. They rely on the interview process, references, code samples, etc. Experienced job seekers are wary of interview processes asking you to self-evaluate your skills because they assume the current team has been evaluated similarly. There's little (if not an inverse) corellation between people who think of themselves as the absolute best and those who actually are talented. The most effective people know that there's always plenty of room to grow. Developer salaries almost double with 5 years of experience and then begin to flatten out. 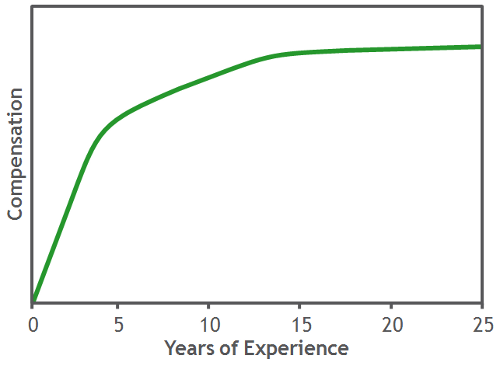 The graph below shows how compensation changes per X years of experience. A graph of individual compensation over time won't look exactly like this because individuals typically only see large salary bumps when switching jobs. This graph shows what salaries at different experience levels look like at this instant [1, 2]. Why is this the case? Experienced engineers are not coming on to the market at the same rate companies are demanding their services. Sure, engineers graduate from college every year, but they're inexperienced and companies are willing to pay a premium for someone who can get up to speed more quickly. If you got a job straight out of college, have kept it for a few years, and haven't received major raises each year, you can probably command a higher salary than you think on your next job change. If you're a more experienced developer, think about joining a startup. You'll get paid toward the high end of the inexperienced range in terms of salary, but you can likely negotiate a much higher equity stake. Hire inexperienced or minimally experienced developers, train them, and retain them. Continue to give raises to more experienced employees. These will easily out-pace the market. These figures assume no equity compensation. This can vary significantly if you join a startup. These figures and the graph are based on self-reported figures from job seekers and companies (not formally collected data). It's not precise, but there is a clear trend. Hirelite is on a mission to put headhunters out of business. We host speed interviewing events using video chat where 20 job seekers talk to 20 companies for 5 minutes each. If you're looking to evaluate the software job market or looking to hire, check out Hirelite.com. We currently host web events focused on New York City, San Francisco/Silicon Valley, Boston, and Los Angeles. Do you want to have more of a product focused role or a more tech focused role? Do you want to be more of a specialist or generalist developer? Do you want to deal with big data? Do you hope no one expects you to call yourself a rock star, ninja, or guru? Do you favor equity or salary compensation? Do you want a job that lets you work on open source software on the clock? Do you want to work at a company that allows some remote work? Do you want a job that allocates an education/conference budget for each developer? Do you want to get as far away from the finance industry as possible? You might think that it's so hard to find startups that meet your criteria that it may be worth it to talk to a recruitment agency, spell out your requirements, and let them do the work for you. Unfortunately, recruitment agencies don't work for you, the job seeker. They work for companies that pay them 20-30% of what your first year compensation will be. What happens when you tell a recruitment agency what you want? They simply don't care. Even if they care, it doesn't serve them directly enough to understand your needs, so they focus only on how you fit into the molds set by their clients (the companies). They see you as a pay check, as "talent that can't go to waste," I've been told before. They will do whatever it takes to push you into a company desperate for engineers. Their incentives are never going to be in your favor and are often against the companies' interests too. How can you get around this and find a great opportunity? Ask a VC about their portfolio companies. VCs work toward the success of their portfolio companies, not a paycheck based on a single hire. They care much more about quality of fit than recruitment agencies do, and they aren't going to make you jump through hoops just to find out the name of a company that is hiring. "I love this specific company in your portfolio. I have a background in ___, and I'm interested in doing ___ for them." "I have a background in ___, and I'm looking for an opportunity where I can ___ (or that allows me to ___). Do you have any portfolio companies like that?" Basically, you need to quickly convey your skills and what specifically you're looking for. VCs don't have much time to spare, but they will make time for developers who know what they want. When you contact them, include the word "developer" in the subject line. Hirelite is on a mission to put headhunters out of business. We host speed interviewing events using video chat where 20 job seekers talk to 20 companies for 5 minutes each. If you're looking to evaluate the software job market or looking to hire, check out Hirelite.com. We currently host web events focused on NYC, San Francisco/Silicon Valley, and Boston. For software engineering jobs, most companies, especially startups, just can't find qualified candidates, even after tapping their networks. If you're one of these companies who has more trouble sourcing (finding candidates) than screening (filtering out candidates that aren't a good match), here are a few tips to get your job post more attention. Some of these tips may require fundamental cultural shifts for your company. List a salary - if good developers are on a job board at all, you need to let them know quickly whether or not your company is worth their time. Posting any salary information other than "comensurate with experience" or similar is a step in the right direction. For example, you could say, "Compensation is completely open, but here's what we have in mind: $90k + meaningful equity stake." Say that you're comfortable with remote work - there is a huge pool of developers who don't live (or don't want to live) in your city. For companies in cities with a high cost of living, you can pay someone 10-20% less and fly them in once a month/quarter for an in-person meeting. Drop the degree requirement - plenty of good developers didn't go to college, didn't finish college, or went to a community college. You're going to have to look more at experience and focus more on evaluating technical skills during interviews. Guarantee the job only requires 40 hours per week - developers with families, startup aspirations, or other priorities have a tough time finding work in an industry where long hours are the norm. In your job post, underscore that your company works at a sustainable pace, rarely requires fire-fighting, and respects other priorities. Guarantee a response - even great developers suffer from resume black holes. In your job post, state your timetable for making a hire and say that you'll respond to each response you get (even if it's a "no"). Don't look like a recruitment agency - big job boards, especially Craigslist, Dice, and Monster, are overrun with headhunters who make job seekers jump through hoops to find out which company is hiring (so they can protect their massive fees). In your job title, call attention to your company by stating its name and optionally who posted the job description. A post from a tech lead or a CTO will help give developers confidence that their application will be understood. Example: instead of a job title, "Software Engineer", consider, "Software Engineer at MyCompany.com (responses go to CTO)". Offer to train people in a new language - there are times Java or .Net are the right tools for the job, but there are also a lot of developers who would prefer to be coding in Ruby, Python, Scala, etc. In your job post, say that you are willing to consider all good programmers and help them get up to speed on your tech stack. Keep in mind, these tips are only for companies that have severe sourcing problems. These tips may produce orders of magnitude more resumes for you to look at (not all of which will be good), but there will definitely be a few good ones in the batch if you're willing to look for them. Hirelite is on a mission to put headhunters out of business. We host speed interviewing events using video chat where 20 job seekers talk to 20 companies for 5 minutes each. We have two upcoming events: one focused on SF Bay/Silicon Valley software jobs and one focused on NYC software jobs. If you're interested, check out Hirelite.com. From advice to traffic to introductions, Hacker News has been immensely helpful for Hirelite this past year in our mission to put headhunters out of business. Now, Hirelite has reached a point where it can give back. On Tuesday 1/11 at 7pm PST, Hirelite is hosting its first web event focused on SF Bay/Silicon Valley jobs for back-end and generalist developers. You'll speak with either 20 job seekers or 20 companies for 5 minutes each over video chat. At the end of each conversation, if both sides wish to follow up, Hirelite will send you each other's contact information (this generally happens in about 1/3 of all conversations). The event is always free for job seekers (job seekers can sign up here), and to show our gratitude to Hacker News, we're offering Y Combinator companies free admission also (just sign up here, fill in a job description, and shoot nathan@hirelite.com an email). If you can't make it, feel free to reach out directly to any of the companies participating in our SF event, our NYC event, or our previous events.